I admit I tend to believe social media is mostly sound and fury signifying nothing and that no one changes their mind or their actions based on it. However, several months ago I saw a tweet where someone wrote that two friends had drowned over the weekend in an accident and they would have survived if they’d been wearing their life jackets. That made me stop and ponder. I kayak a couple of times a week. While not required, I’ve always carried a life jacket anyway, stuffed behind the seat. 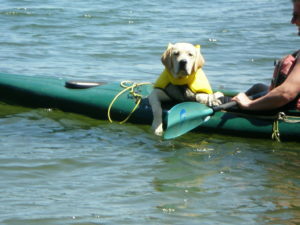 After all, even if full of water, the kayak itself still floats; as Cool Gus proved in Puget Sound some years ago shortly after this photo was taken. But that tweet made me think deeper about the issue. I compared it to seat belts in cars. We’re required to wear them, not just have a car equipped with them. What are we going to do? See the accident coming and quickly buckle up? When would I need a life jacket? In case of an accident. But the very nature of the word ‘accident’ means it would be an unexpected situation. What good was the life jacket behind my seat going to do in that situation? Then I started thinking about various situations, aka, accidents. What if I got hit by a boat and knocked overboard unconscious? How much good would the jacket or even the still floating kayak do me? 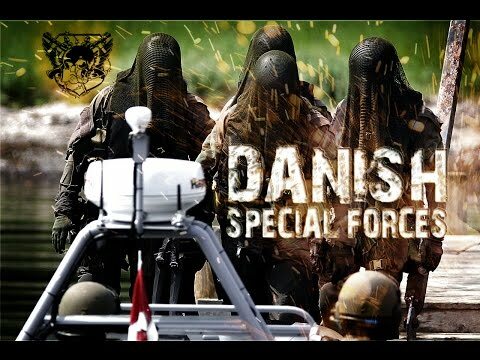 I’ve graduated the Royal Danish Navy’s Fromandkorpset Combat Swim School, which is a nice way of saying I was very cold in the North Sea for several weeks and swam very long distances learning the fundamental rule that dry suits aren’t. But they also had one of their elite soldiers, the equivalent of Navy SEALs, drown during a mission while we were working with them because he was knocked unconscious by the concussion of an explosion. The more I thought about various scenarios, much like we used to “war game” our missions in Special Forces during Isolation prior to deployment, the more I realized that not wearing the jacket was akin to driving without my seatbelt buckled. From that day forward, even on the calmest times on the water, I started wearing the vest. The first thing I realized was that I didn’t have it adjusted correctly. So I had to do that and it would have been too late if I needed it in an emergency. Then I thought about some other things. In Combat Swim school and during training and missions on my A-Team, which was maritime operations designated, we wore certain safety gear. A strobe light on our arm. So I also added a waterproof strobe into a pocket on the life vest. Along with an emergency whistle and a waterproof Quikclot bandage (I’m a big fan of having one of these with me on any outdoor adventure such as kayaking and biking). And then I remembered the last time I flipped in deep water, thank you Cool Gus, in Puget Sound (picture above) and how very hard it is to move a water filled kayak. So I added swim fins to better be able to pull the kayak if I was far from shore and a hand pump. Why was all this important? Normally I kayak on the placid TN River. But the other week I was kayaking down the much more turbulent Little River out of the Smoky Mountains. I hit a submerged rock a glancing blow and the kayak went over in swift and deep water. It took getting swept along quite a ways in rocky, white water, to be able to swim the water-logged kayak to shore. If I had not had my life vest on, the situation could have been even more perilous. Also, if I’d been hurt, I was in a ravine where I couldn’t be seen from the higher shoreline. No one would have known I was there, so the whistle could have come in handy. Additionally, I have a tether for the paddle. That was fortunate because, at the very least, I would have lost my paddle. And there were a couple of times, as I was being battered and swept down river next to the kayak that I lost my grip on the kayak but still had hold of the paddle and the only thing that kept us connected was that tether. It’s a lot stronger than it looks. Here is an image of my kayak and the various gear including paddle, tether, life jacket, pump, waterproof container (with tether for my iPhone), water proof container with locking snap link for my wallet and keys. BTW– those waterproof containers worked and were important. Bottom line, I managed to get to some rocks near the edge of the ravine. Filled with water, I couldn’t turn the kayak over or lift it out. So I spent a long time, waist deep in cold water, pumping it out before being able to lift it out to drain. Moment of enlightenment—two people died because they didn’t wear their life vests; I don’t wear mine. This is why I tweet and post a lot of prep/survival stuff and have free slideshows for download. Because I can learn new things and pass on what I learn. Has anything you’ve encountered on social media changed an action for you? Great information! Do you care if I share a link with the local news web-site — ColumbiaMagazine.com? There are several kayakers in the county and this consideration of an accident might save someone’s life. I also recommend wearing a helmet for rocky rapids. Mine saved my noggin during the last kayak trip ever. Scared me silly. Glad you took the time to get and stay properly equipped. Excellent info, as always. Thank you for sharing such important information. You might save a life.